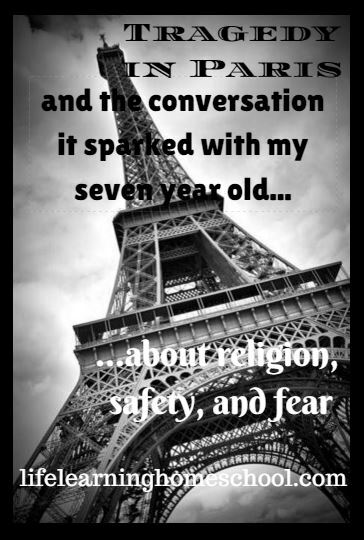 The Tragedy in Paris and the conversation is sparked with my 7 year old son about religion, safety and fear. I would like to preface this article with two things. I am pro-gun (I own one, I know how to use it and I carry it – legally) and I love Jesus. If either of these things bother you, you might not want to read this post. So last night I’m reading about Paris. And I thought, you know, we NEED to have this conversation. Part of me wanted to just go about our day today and not say anything to BigG about it and let him live in his oblivious little bubble. I was almost twice his age when my oblivious bubble burst – I was unaware of this level of evil in the world until the Oklahoma City Bombing in 1995. I was 11. Of course I knew of wars in the past….but that was past. I thought the world was sunshine and rainbows now. Until Oklahoma City. Then there was Columbine. And 9/11. And then, in BigG’s lifetime, there have been so many of these “events” that I can’t even keep up with them anymore. More in the last 1/4th of my life than in the first 3/4ths. So just because of the sheer volume of these events and the nature of the world we live in today, I decided that 7 years old was okay to learn that the world is NOT sunshine and rainbows. And that this was a good situation to use to spark a conversation I knew we needed to have. I paused here to gauge where we were. His maturity level was on the high side today so he was taking it in. He thought of something funny I might tell him today and it made him laugh. I let him have the light moment. And then I used a couple examples that I knew he would relate to. One is from his karate class, where his instructor has talked several times about being uncomfortable with how someone has approached you – they’re too close or they look threatening – this is when you use your knowledge of karate to your advantage. I told him that was an example of being SMART not scared in a bad situation. Then I used another example from when we went to the zoo just last week. It was late in the day close to closing, on a Tuesday, which isn’t a big day for the zoo anyway, so it was a ghost town. We were in the primate building and there was a man in there also. And he was following us, chatting with us about the monkeys. But every time we would leave one area and walk to the next he was right behind us. And he was too close. In a room with a 30 foot wide window for watching the orangutans, there was no reason for him to be 2 feet away from me. None at all. So I casually rushed G from one room to the next until we got to the end and then I leaned down and said, “Bathroom. NOW.” There are restrooms just outside the exit of the primate building – they are outside the building and face the main walkway through the zoo – I felt better once we got in the open but I didn’t want this man thinking he could stay on our heels through the rest of the zoo. So I diverted G to the bathroom. When we got in there he said, “I don’t need to go.” I said I don’t either but I explained to him that I was uncomfortable about that man following us and I wanted to get away. It turns out this event was a PERFECT example to use in our conversation today. With that I felt like our conversation was complete and productive. Not ended – because I know the topic will come up again – and it needs to – just like the discussions about tricky people and safety when we are in crowded places reoccur in small bursts here and there. How much do your kids understand what’s going on in the world? What kinds of conversations have you had with your kids about these kinds of dangers? Do you need to have a conversation? You handled it very well. Great discussion.